Is there anything more classic than a fabulous cedar shake beach house? We don’t think so! This stunning Westport, Connecticut beach house by Austin Patterson Disston Architects is just the kind of place that would be perfect for Spring Break! Well, a very, very sophisticated Spring Break! Nothing says “beach” like a gorgeous natural fiber rug. And a roaring fire makes this beach house perfect for year round relaxation and fun. Every part of this house is clean, crisp and has the feeling of a chic escape. Nothing adds a casual, put-your-sandy-feet-up feel quite like a slipcover. It makes for easy clean up at the end of the season too! This sleek countertop is reminiscent of the sand outside the door. A recessed sink makes cleaning a breeze–and entertaining a cinch! Speaking of entertaining… This is such a well-stocked bar! Everyone needs simple, beautiful barware. Open shelving lends to the perfectly undone vibe of the beach house. Earth tones are a perfect fit. Wood paneling is a necessity for a beach house! 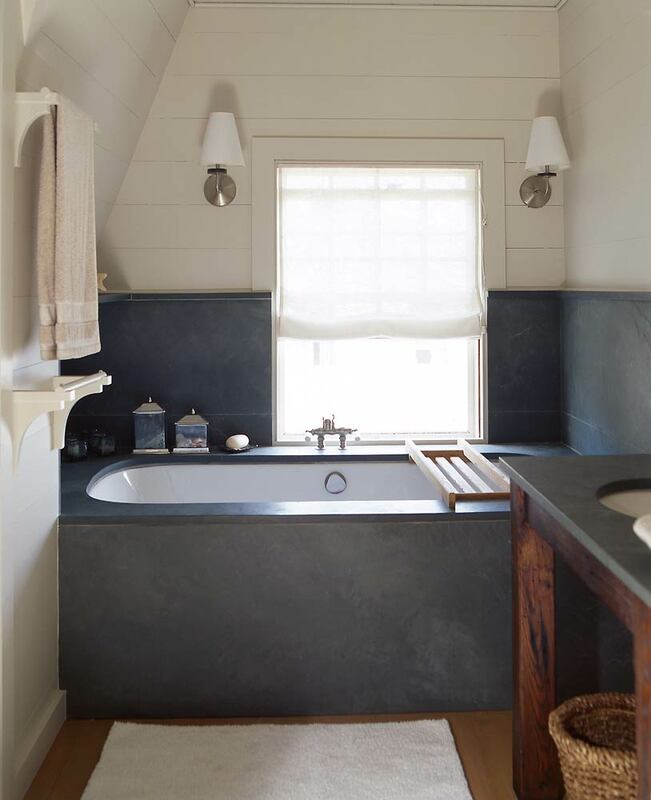 It juxtaposes beautifully with this fabulous tub and creates a totally custom look. An outdoor shower is the perfect finishing touch for this incredible home. And the kayak? Icing on the cake! With Spring Break right around the corner, do you have plans? Loving this beautiful Instagram pic of Slightly South of Simple from our fab friend Mary Anne from Classic Casual Home! It’s so hard to believe that I’m leaving for the Slightly South of Simple tour in less than a month! Check out the tour schedule and see if I’m coming to a city near you. I’d love to see you! Mary Ann’s Instagram and we’d love for you to visit us on Instagram, too! For outdoor style and adding loads of curb appeal, few things top the timelessness, simplicity and style of a climbing vine. Fresh and festive, with flowers or without, we adore this look for turning a plain exterior into something extraordinary. If you’re going to hide away, summer is a great time to do it! And this fabulous Sagaponack home by Architect Thomas Kligerman and decorator Elissa Cullman is the epitome of a hideaway. It’s the essence of charm, a white picket fence, the thing that somehow instantly takes a yard from plain to a dream come true. You know we love a cedar shake cottage. And when that cedar shake cottage is designed by our friend and one of our favorites, Andrew Howard, all the better! We just love how Howard combines patterns and textures, furnishings and accessories in a way that is super chic but also family friendly and oh-so livable.